Systems of community organization rooted in sacred beliefs and concepts guide relations in Bali, Indonesia, and help defy agribusiness and mega-tourism. Of the more than 17 thousand islands that make up what is now known as Indonesia, Bali is a world tourism hotspot. The millions of people who visit each year come in search of its beaches, rice fields considered a world heritage site by UNESCO, and its famous Hindu temples. And it’s no coincidence Bali is referred to as the Island of the Gods: one of its main attractions is the set of sacred practices that form part of daily life. However, what many don’t hear about is the impact of tourism on the life of local communities. The age-old irrigation system of subaks is an expression of community relations in Bali. Legally recognized as a simple mechanism of irrigation, subaks are an ancient system of beliefs that guide the way people relate to each other and other spheres of life. Consequently, subaks are not only irrigation channels that provide water to flooded rice fields or for the cultivation of fruit and other foodstuffs. They also connect the elements that make water the religion of Bali: time, land, the air, the forests, the crops, dances, offerings, and temples. Subaks are part of the life experience of the communities and are managed by federations that are made up of leaders whose role is to observe them from an integrated perspective. Threats to the subaks, however, have been building up over the last 50 years. In the 1970s, Suharto’s dictatorship forcibly introduced “green revolution” packages in Indonesia: farmers were forced to use new “improved” rice seeds produced by corporations which required high levels of fertilizers and pesticides. Those who refused to use the seeds were imprisoned. As a result, the cultivation of Bali’s traditional seeds declined, the water became polluted with agro chemicals, and families were made dependent on the farming supplies that they were forced to buy. These traditional social systems had to contend with the imposition of a “modernized agriculture” and, almost simultaneously, Bali’s new status as a tourist destination. Economic sectors began to covet their seas, land and forests, transforming what was a complex cultural and philosophical system into a commodity that could be sold as a tourist attraction. Since then, mega-tourism has caused an exponential increase in the demand for water and an expanding construction sector (roads, hotels, resorts, retail), widely promoted by investors. Due to a lack of sanitation, much of the waste from local sewers is discharged directly into subaks that are distributed throughout the island. These are also used to supply water to the villages and to irrigate the rice fields, which are the center of reproduction of life in the communities. In Bali, there are 17 names for a grain of rice according to each stage from when it’s planted to the dinner plate. 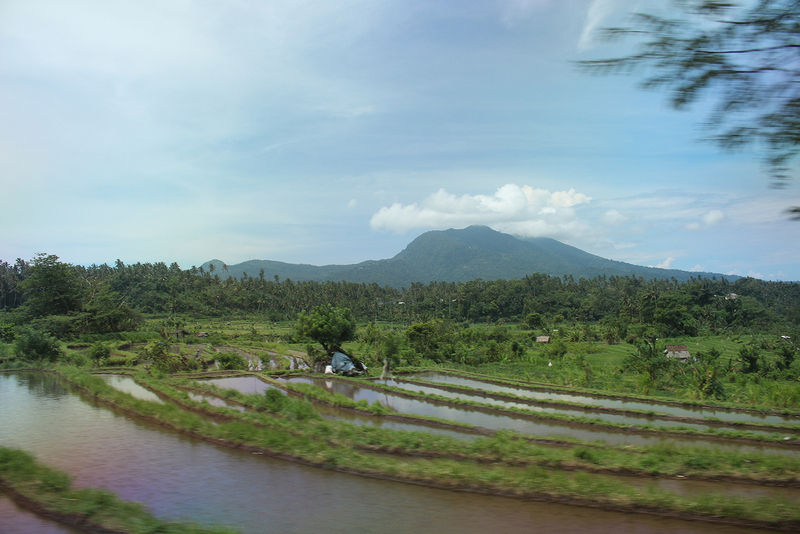 The rice fields in Jatiluwith, South of the Batu Karu volcano, have become a world-famous tourist attraction. Spanning over 2 thousand hectares, traditional Balinese seeds are cultivated in terraces of rice that meet the needs of local families. An integrated cultural system of 20 subaks is connected to the forest and to Lake Tambligan, all protected by a series of temples, the largest of which was built on top of a volcano. The carefully designed and flooded terraces are part of a UNESCO World Heritage Site. Its worldwide fame, however, attracts 160 thousand visitors each year, leaving communities in a dilemma: what could be a source of income actually favors the appropriation of land and housing by outsiders as well as the reduction of available water for the rice fields, especially in the dry season. While communities await resources from UNESCO, there is no regulation to prevent the land being bought up by investors, putting at risk the way of life of the communities, their subsistence and the world heritage site itself. In spite of the imposition of the “green revolution” and the appropriation of the area by tourist investors, traditional agriculture provides continuity, helping to defend communal land ownership and to re-establish the relationship with the sacred. In the Karangasem district of East Bali, 214 families have joined together to produce organic rice and other crops. The plan is to return to traditional Balinese rice seeds, which do not require fertilizers and pesticides and last longer after harvest. As different subaks share the same source of water, families know that if they use chemical products, they would not just be contaminating their own community, rather the whole system would be affected. “According to the ancient inhabitants, we must not take water just for ourselves, much less sell it. The same applies to farming. We borrow the water and then return it just as we found it. We make daily offerings to the water, and water will be provided as long as we respect it,” explains Dwi Mardana, a farmer from the Peladung community located at the foot of the Agung volcano. The same local community prevented the French multinational food giant Aqua Danone from exploiting its water sources in 2010. Farming families unanimously voted to block the company from extracting the water to bottle and sell even though local leaders favored such extraction. The sacred nature of water (treated not as a good that is retained nor a merchandise) prevailed over the promises of employment and money offered by the government and by Aqua Danone, which had agreed to hold a vote, confident that they would win the community support for their project. They were wrong. In the confrontation of opposing ways of conceiving the world, victory went to the importance for the sacred, rooted in the day-to-day life of the people, and representing an imprint of their identity. “Water is our religion and our way of life, so it’s just not possible for someone to come here and disturb that,” summed up Dwi. In Bali, communities have their own traditional systems of “community regulation” known as adat, which is based on customs passed down from generation to generation, and which go beyond State laws. The case of the resistance to the business plans of Aqua Danone in Peladung, demonstrates the strength that this community regulation can have, and is one of the examples of the contradiction between the logic of the State and that of the community. To the south-west of the Batu Karu volcano, in the center of the island, Munduk, which dates back to the 8th century, is one of the four communities that protects Lake Tambligan, offering another demonstration of how “community regulations” can prevent the appropriation of life by the tourism industry. Surrounded by forests, the region is coveted by businessmen and loggers. However, any economic activity requires the permission of the local community. In the 13th century, the community that lived on the shores of the lake decided to move to the foot of the mountain, leaving its old settlement surrounded by temples for protection. Here, as in other parts of the island, resistance is linked to the sacred: the community has its own project to protect Lake Tambligan, which is considered a source of life, and has therefore repeatedly fended off the incursions of the business sector. In the ancient village of Tenganan, which is protected by mountains and symbols of Balinese resistance to successive invasions of the island, a strong manifestation of “community regulation” was able to impose limits on the expansion of the tourist industry and impose a moratorium on logging in over 900 hectares of forest. Although tourists have visited since the 1970s, the community, considered the oldest in Bali, has an internal code and decision-making system that, as in Munduk, have prevented businesses from gaining access to the area. In Tenganan, the adat has a set of rules and sanctions that community members must follow to protect their culture and way of life, although they may decide to receive tourists and an income from tourism. Land, for example, cannot be sold and tourists are not allowed to stay in the community or take part in sacred ceremonies. The residents of the community themselves cannot take photos of rituals. Children go to the school that is located outside of the community, but they also participate in the educational process on internal regulations. Such resistance shows that the tourist industry acts in a manner similar to the extraction sector, threatening the livelihoods of local communities, and co-opting local leaders and youth. The commercialization of land on the global market plays an important role in this process. A clear example of this is a large project in Benoa Bay, at the southern tip of the island, where Denpasar International Airport, the main tourist portal, is located. This is the only place in Bali where you can see both the sunrise and sunset over the sea. At the end of his term in office, the ex-president of Indonesia, Susilo Bambang Yudhoyono, signed a decree that converted a conservation area into a “reclamation” project. The current government of Joko Widodo has continued this initiative. The project, which has the backing of the World Bank and a large local economic consortium led by tycoon Tomy Winata, Tirta Wahana Bali International, includes the construction of artificial islands interconnected by bridges for the location of resorts and other tourist ventures, as well as a Formula 1 racing circuit. Thousands of jobs have been promised. However, Benoa Bay is home to numerous fishing communities who are dependent on the sea and would be prevented from accessing their temples, lands and the bay, as well as their fishing boats. In addition, these communities live off the mangroves, which have been left out of the “reclamation” project. Faced with the threat of losing community territory and the appropriation of lands, in addition to the destruction of the mangroves, a huge resistance movement has formed in Bali against the bay project. Consisting of island inhabitants, artists and activists, the ForBALI Balinese Against Reclamation Forum, has managed to delay the plans of the government and the private sector through protests, meetings with local leaders and demonstrations in front of public institutions. Resistance in Bali thus consists of the coordination between the ForBALI movement, the strength of traditional “community regulations” or adats, and the experience of the sacred as related to the subaks, the forests and water. It is also due to small but emblematic actions: in order to hide the beauty of their rice fields, communities erected large billboard posters that prevent curious tourists from taking photographs of their daily activities on the plantations. The sacred continues to resist, opposing concepts of the world as represented by the “green revolution” and forms of tourism that transform everything into a business.